Hey, Disney fans! I have a 30 Day Disney Challenge for you to check out. You can do this alone or with some friends. If you are having a sleepover party, consider printing this list out and using it as a questionnaire. From favorite movie quotes to the best rides in the theme parks, this game covers it all. Are you on Instagram?! Consider using this Disney challenge as a format for a daily challenge. Try to take pictures in a way that can answer each of the questions. You can really get creative if you are into Disneybounding! Are you on vacation? Or planning a vacation? Use this list as a way to have conversations around the dinner table! Who is your favorite Disney princess? Favorite villain? Favorite Disney theme party? What about your favorite Disney dessert? These 30 questions will give you enough ammunition to keep the conversation going for days. No, one worded answers allowed! Everyone must elaborate! It’s not enough to say that your favorite Live Action Film is “Beauty and the Beast”. You have to tell the group WHY!! A few years ago, I attended D23 in California and I WISH I had this challenge with me because it would have been a blast to do something like this with true Disney fans. We would all take the bus together from the hotel and just talk about the ENTRANCE LINES. But if we had something to guide the conversation to something FUN, it would have been a better experience. Parents, if you have an upcoming road trip, consider asking your children a new question at every new exit, or toll, or rest stop. It all depends on how far you have to go! Maybe every 20 miles! However, you need to split it out. That way, it will give them something to look forward to and you can have a smart way to split up the kids’ time. 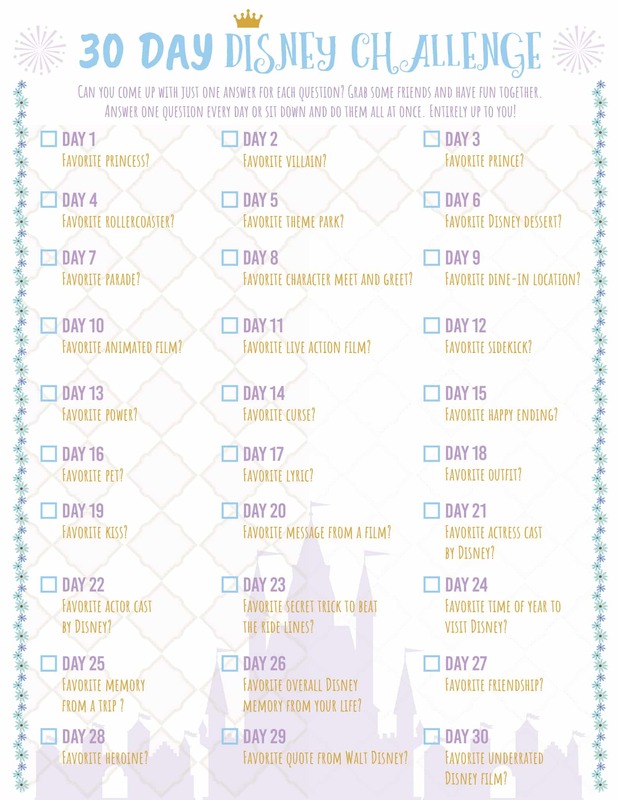 Click here to download the 30 Day Disney Challenge. Download as many copies as you’d like. You really need to print copies for everyone involved. So, make sure you have enough. Need some help with your answers? Here are a few tips! Bucky the Squirrel, The Emperor’s New Groove. Young Simba, The Lion King. Prince Ferdinand, Snow White. . I hope this list has given you some pixie dust inspiration! Enjoy the challenge with your family and friends and keep on loving Mickey Mouse with all of your heart. He keeps us young! For more Disney inspiration, click here.